Our "BEST SELLER" is ENCOURAGEMENT. . . and that's free. 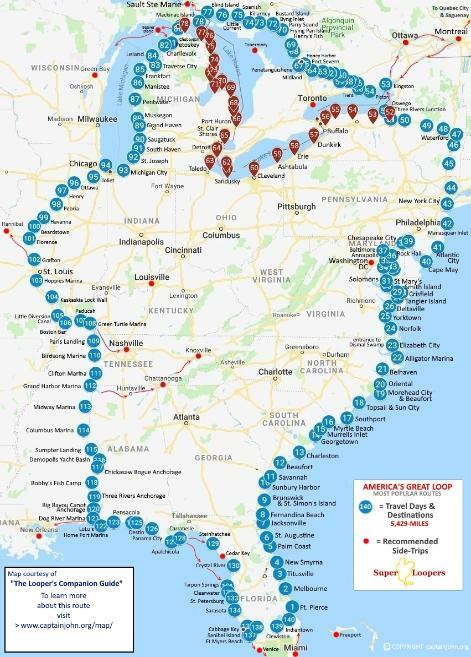 HOW SAFE & EASY IS IT TO CRUISE AMERICA'S GREAT LOOP? Ever paint by the numbers? Well, it's not quite that simple, but almost. How easy is it? We think it is as easy as 1, 2, 3. . .
of “travel days” on either one of the two most popular Great Loop routes. keeps you entirely in the USA. our suggested detours and side-trips. end up averaging only about 40-miles a day. interesting to you - and believe us - there will be lots of them. before you eat, flush, take a nap, and hold hands when crossing the street. are never more than a stone's throw from it. protects boaters from the potential hazards of the wide open sea. across New York Harbor, past the Statue of Liberty to Liberty Landing. routes meet again at Mackinac Island. the Gulf Intracoastal Waterway near Mobile, AL. second place we must 'go out' for another 76-mile run to Steinhatchee. even made it a permanent way of retirement life. Cruising Canada is amazingly beautiful.